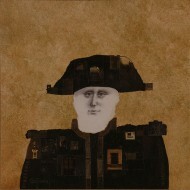 Alfredo Castañeda was born in Mexico City in 1938. 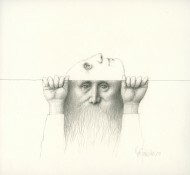 He received a degree in architecture from the University of Mexico in 1964 and in 1969 he had his first one-man show at the Galería de Arte Mexicano, the gallery which represents him worldwide outside of the U.S. His surrealist imagery intrigues viewers and his works are included in private collections in Mexico and Latin America, the United States, Europe and Japan. In 1983 he had his first individual show in the United States at Mary-Anne Martin/Fine Art and has been represented by MAM/FA in the U.S. since then. 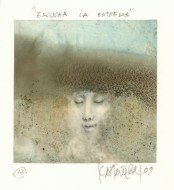 A retrospective of his work was held at the Monterrey (Mexico) Museum in 1990 and a monograph celebrating twenty years of work was published in the same year. Since then he has had a number of exhibitions in the U.S. and Latin America which are detailed below. Castañeda lived in Madrid, where he died in 2010. The concentric circles of art and mysticism are one in the work of Alfredo Castañeda, creator of one of the most authentic and original bodies of work in contemporary Mexican art. A major oeuvre, no doubt, and one that continues to grow. His works are doors to houses and temples whose walls are fields and oceans which are bodies, which are also words, which are also images. No one in Mexico has done quite this before. No one has walked where he takes us, astounded, filled with his mystery and his smile. 1992 En cierto sentido (In a Certain Sense), Galería de Arte Mexicano, Mexico, D.F. 1984 Introducción a la Guerra Santa (Introduction to the Holy War), Galería de Arte Mexicano, Mexico, D.F. 1982 Ilustraciones, Galería de Arte Mexicano, Mexico, D.F. 1980 Acercamientos, Colegio de México, Mexico, D.F. 1978 Del purgatorio: Recordatorios, visiones y testimonios (From Purgatory: Reminders, Visions and Testmonies), Galería de Arte Mexicano, Mexico, D.F. 1976 Del Común de los Santos (On the Commonness of Saints), Galería de Arte Mexicano, Mexico, D.F. 1975 De Esta y de la Otra Orilla (Of This Shore and That), Galería de Arte Mexicano, Mexico, D.F. 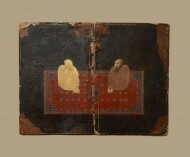 1973 Oraciones, retratos y adivinanzas (Prayers, Portraits and Puzzles), Centro Universitario Cultural, Mexico, D.F. 1972 Museum of Modern Art, Mexico, D.F. 1971 Galería de Arte Mexicano, Mexico, D.F. 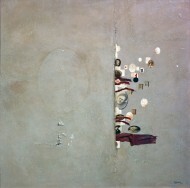 1969 Galería de Arte Mexicano, Mexico, D.F. 1991 Mexico: Figures of the Eighties, Instituto Cultural Mexicano, San Antonio, Texas and Washington, D.C.
1986 The Sacrifice at Confrontation 86, Museo del Palacio de Bellas Artes, Mexico, D.F. 1985 50 Años de dibujo en México (50 Years of Drawing in Mexico), Galería de Arte Mexicano, Mexico, D.F. This exhibition was part of the gallery’s 50th anniversary celebration. 1985 Homenaje a los artistas de la tercera época (Homage to the Artist of the Third Generation), Galería de Arte Mexicano, Mexico, D.F. This exhibition was part of the gallery’s 50th anniversary celebration. 1985 Antiguo Testamento, nueva visión (Old Testament, New Vision), San Carlos Museum and the Instituto Nacional de Bellas Artes, Mexico, D.F. 1984 Master of Drawing, Chopo Museum of the National University, Mexico, D.F. 1978 Marco Cultural Arquitectura, Instituto Nacional de Bellas Artes, Mexico, D.F. 1973 Pan-American Graphic Arts Show, Museo del Palacio de Bellas Artes, Mexico, D.F.